Wounded, off the grid, and needing to rescue his partner from a Saudi jail ... Javin Pierce wants to settle the score with the traitor who double-crossed him. With time short and options few, Javin strikes a shaky deal with sworn enemies. But before long, alliances crumble, and Javin's rogue team is surrounded on every side. Now, desperate to rescue his partner and exact retribution with no one to trust, can Javin survive the deadliest mission of his life? 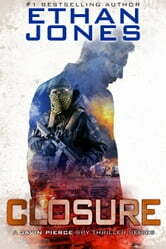 With a plot ripped from tomorrow’s headlines, Closure, the third book in the all-too-real Javin Pierce international espionage thriller series, confirms Jones’s status as a spy fiction master alongside Flynn, Clancy, and Fleming. If you like novels that are loaded with action and suspense, barreling at neck-break speed with well-crafted characters and ingenious plots, you are guaranteed to love Closure. Closure is the third novel in this best-selling series with hundreds of five-star reviews and thousands of sales and downloads. Each book is a self-contained story without cliffhangers and can be enjoyed on its own. Scroll up, click and get lost in the fast-paced intriguing world of Closure now. Can you imagine being a spy and your boss betraying you? Well, Javin and Claudia correct that problem. If you like spy stories, this is another great series by Ethan Jones. A terrorizing, horrifying, blood chilling and intriguing read. The story grips the reader from the beginning. It intensifies up until the last page. Intrigue mounts to mountainous proportions with drama, tension, suspense, twists and turns. Come along with Javin Pierce and Claudia Aquarone as they both take on mission to discover why they were betrayed by their boss. These two agents are Correctors for the Canadian Intelligence Service. They carry out missions that other agents have failed completing. But on one of their missions they were compromised and betrayal from within. They have gone rogue to expose their betrayer. These are phenomenal in-depth characters with human flaws, human emotions and experience shaped perceptions. This story is so well written that the deft description will make you feel as is you need a bullet proof vest as you tag along right there with these characters. This is book # 3 in the Javin Piece Spy Thriller series. It can be read as a stand alone but you really should read the first two books as they are just as exciting. This book picks up where book 2, Betrayal, left off so it is best to read that first. Claudia is detained in Saudi Arabia and Javin is trying to keep her safe and also deal with the person who betrayed them while on the run from his own agency. The backstabbing and betrayal continues and I was trying to figure out who was really aligned with whom, and why, all through the book. The situation and characters were changing throughout the book as multiple operations were going on and few things went as intended. It was hard to put this book down. If you like lots of action and plot twists, this series has it.